You may run your eBay business from any computer, anywhere in the world. If that’s the case, you might do best with an online service. Auction-management websites handle almost everything, from inventory management to label printing. Some sellers prefer online (or hosted) management sites because you can access your information from any computer. You might use every feature a site offers, or you might choose a bit from column A and a bit from column B and perform the more personalized tasks manually. Read on to determine what service might best suit your needs. One of the things that makes Vendio unique is its range of offerings. In addition to auction management, Vendio has a full complement of research tools and other offerings. Each tool, should you choose to use it, is offered a la carte. Item and inventory management: Keep track of your items and launch with a click from their site. Image hosting: For eBay auctions, image hosting is based on how much you need at a time. For $2.95 a month, you can store up to 3 MB of pictures. Auction reporting: Generates accounts receivable, item history, and post-sales reports from the Reports area. Reports include customizable views of your sales data, item and auction data, accounts receivable, and sales tax. Templates and listing: Choose from over 160 very professional listing templates. You can use their predefined color templates or use your own homemade templates. Post-auction management (included in Basic Sales Manager): Sends out automated e-mail to your winners, linking them to your own branded checkout page. If customers want to pay with PayPal or your own merchant account, they have to link from there. Vendio combines multiple wins for shipping and invoicing. You have the option to set six different feedback comments, which you choose at the time of posting. 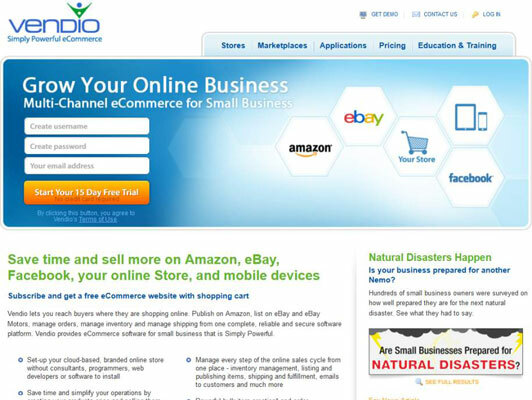 Vendio offers a fully customizable store you can place on your own web space — at no additional charge. When you set up your store, all your listed items are seamlessly integrated. Visit their site for a free trial. 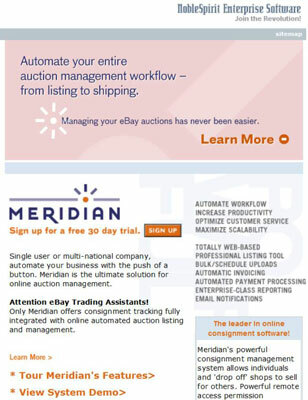 Meridian Software was developed by eBay Shooting Star Top Rated Plus seller, Joe Cortese. Through his own experience on eBay, he developed this service to fulfill all the needs of an eBay seller, at a very reasonable price. Item and inventory management: Includes calendar- and time-based scheduling (that is, dates and times for launching auctions), automated auction launching and relisting, the capability to import past or current auctions, and the capability to import auction data from a spreadsheet or database. Image hosting: Offers space for storing pictures. You can upload bulk images to its website or FTP your images directly. Auction reporting: Generates current running auction statistics — the total number and dollars of current and past auctions — and an itemized report of each auction. Post-auction management: Allows you to send (manually or automatically) a variety of customized e-mails to winners and nonpaying bidders. Your invoices can link directly to PayPal. Consignment tools: For sellers who sell for others, Meridian offers complete tracking and inventory by consignor. The post-auction management features also include the ability to send automatic feedback and to create mailing labels for each sale. So that feedback isn’t posted until you’re sure the transaction is successfully completed, you have the option of disabling the automatic feedback feature. Way back in 1999, Standing Wave Software developed a product that would handle large inventories and meet the needs of the growing eBay population. Enter Auction Wizard. In 2000, the company introduced a more robust version, Auction Wizard 2000, to meet the challenges presented by changes on eBay. Handle consignment sales. Keep track of consignment sales by consignees, including all fees. Edit your images before uploading. The software allows you to import your images, and crop, rotate, or resize images for your auctions. Upload your pictures with built-in FTP software. You can do this while you’re working on your auctions, eliminating the need for another piece of auction-business software. To begin using the software, simply download your current eBay auctions directly into the program. When your auctions close, send customized e-mails (the program fills in the auction information) and manage all your end-of-auction business. 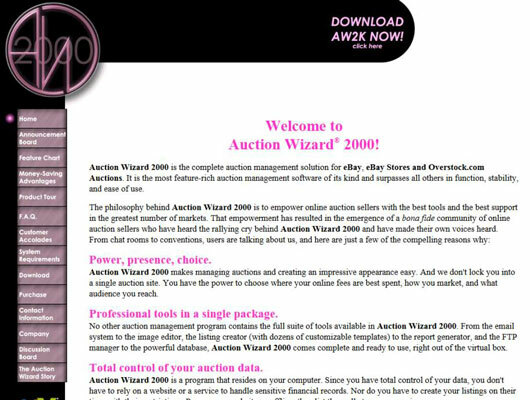 Some sellers launch their auctions using Turbo Lister, and then retrieve them and handle the end-of-auction management with Auction Wizard 2000. Visit their site for a 60-day free trial.